After a day of complex musical experiences, sound artist Kasper T Toeplitz and dancer Myriam Gourfink proposed a concert of radical simplicity. Noise art can be irreverent, challenging and confrontational, but Toeplitz and Gourfink’s hour-long arc of noise left me feeling cleansed. Noise audiences are no strangers to slow changes in texture, but Gourfink’s movements bring a new level of embodied appreciation to these prototypical forms. Myriam Gourfink is a master of micro gesture, performing slow and small movements over long durations. In Data_Noise she turns slowly on the spot, arms held out wide as she pivots on and off a table. She is an inveterate planker, spending most of her time half-on and half-off the table. Her extreme physical control extends right to her eyes and face, which are fixed in an eerie half-smile for the entire performance. 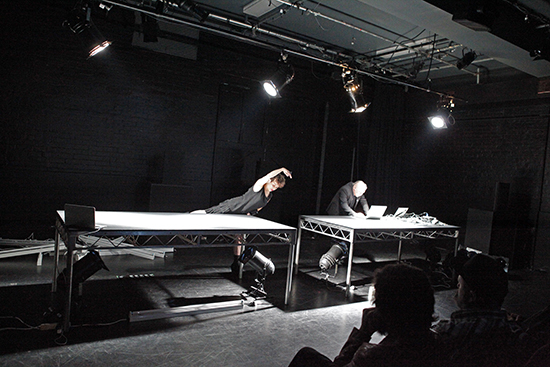 Her movements are translated into data by sensors on her arms and legs, as well as a pad of buttons that she stands on for the brief earthbound moments of her performance. This data controls parameters in Toeplitz’s sound design, making the dancer and sound artist true collaborators in the total experience. Toeplitz’s noise does not attack you with eardrum-shattering bursts of sound—it is bread-and-butter noise. Layers of hums and static build to a crescendo and fade, rumbling through your body like a wholesome deep-tissue massage. The introduction of a heartbeat at the loudest part of the performance (was it Gourfink’s?) enhanced the already deeply embodied sonic experience. 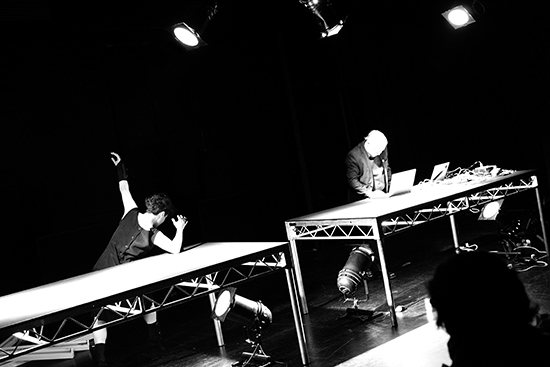 With the performers dressed in black inside a black box performance space, the immensity of Toeplitz’s sound design took on fantastical proportions. To me the performance evoked a natural setting. The granular-synthesised atmospheres sounded like the leaves of a great forest rustling and dissolving in the depths of a deep, black lake. Projections introduced over the entire performance space added clusters of long, curving lines like reeds swaying in the wind. When projected over Gourfink’s body the moving lines became a dazzling, rapidly flashing pixellated texture. Dance is a great aesthetic leveller. Audiences who cannot stand contemporary music may enjoy it during a contemporary dance production. Similarly, Toeplitz’s layers of white noise have found their choreographic match in Gourfink’s micro movements. After an hour of tracing the mutating envelopes of Toeplitz’s sonic layers through Myriam Gourfink’s rotating limbs (or was it the other way around?) I left the black box of the Old Fire Station ready for another day of—sadly static—orchestras and chamber music.